“You can’t mess up a good steak” is a comment that Chef Jensen Lorenzen fundamentally disagrees with. First, the meat’s got to come to room temperature before you even think about cooking it. Then, you’ve got to pat it dry, lest you mess with the important caramelization process. Next, toss on a liberal sprinkling of salt and pepper (Lorenzen hates to break it to you, but seasoning ahead of time only creates a tough, dense dinner). 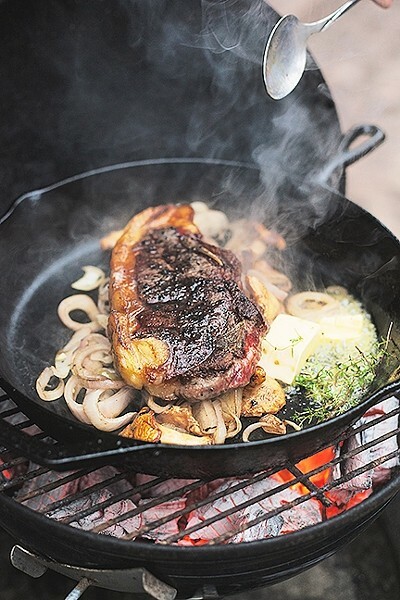 GRILL LOCAL: Spring beckons, and so will your grill. Sign up for a Larder Meat Co. meat box and ensure local, ethically raised beef (and chicken and pork) is delivered to your doorstep monthly. Then comes another patting (seasoning will bring more moisture to the surface). Heck, just grab the whole roll of paper towels. Now, pop that bone-dry sucker on the grill over the hottest coals possible, then finish in a cooler spot (searing on a cast iron skillet and finishing in a 400 degree oven is also good). Next? The probing, resting, and—finally—the serving. Don’t screw it up now: Use a very sharp knife carved straight across the grain. If you must adorn your feast, a dash of old school Worcestershire sauce will do, although Lorenzen recommends a simple drizzling of the gravy of the gods (aka hot, bloody meat juices). Now I’ve got your attention. But here’s the catch, dear reader. All of this care—all of this attention to detail, all of this love—is wasted on a subpar piece of meat. Take it from a guy who’s seen behind the murky screen that divides diner, buyer, chef, and farmer. That mass-produced steak plumped quickly with chemicals and corn was raised in a commercial feed lot and trucked halfway across the country. It is the equivalent of a sturdy but flavorless greenhouse tomato available in the dead of winter. Let’s just say that this way of eating is not delicious to your taste buds, nor is it kind to the planet. There is a better way, and you know what I’m going to say. Grill local. Sear seasonally. Roast regionally. But how? Along with his wife, Grace, the chef has answered that question. The duo is on a mission to honor local meat producers by making the eating of these delicious, sustainable proteins shockingly easy. Filled with local chicken, beef, pork, sausage, and plenty of extras like recipes and seasonings, the new Larder Meat Co. subscription box is the meat lover’s answer to that beloved CSA (community supported agriculture) veggie box you’re already ordering. Think about it: Why stop at local radicchio when you can get rosy, well marbled beef from Adelaida Springs Ranch in Paso Robles or heritage, avocado-finished pork from Stepladder Ranch in Cambria? Not only would you not need to shop for meat, you would probably eat less of it and savor the flavor more. “We’re not working with massive consolidated meat growers that sell to massive producers. The model works like this: One person grows the meat. I buy it. Then, I give it to you,” Lorenzen said during a recent interview that got me seriously craving a thick bacon burger. In a nutshell: The couple buys whole animals from San Luis Obispo and Santa Barbara counties, then divides the haul equally between their subscribers. Only healthy, ethically raised meats make the cut. MEET THE HERD: Larder Meat Co. Owners Jensen and Grace Lorenzen with their 3-year-old son, August. The San Luis Obispo couple is on a mission to bring local meats—chicken, beef, and pork—to your doorstep every month with two sizes of Larder Meat Co. boxes to choose from. Seem too simple? Well, the concept has actually been a very long time coming. It took Lorenzen years to get to this point in his life—which is to say, traveling to local ranches, procuring and packing up bones, ribs, and breasts, and making huge vats of broth or jars of tallow for his beloved subscribers. In a way, he’s solved a nagging question that’s plagued him throughout his cooking career. Speaking of that career, I should say Lorenzen is locally famous for creating a unique garden-to-table culture at Cass House restaurant in Cayucos, which closed in 2014 when ownership changed hands. Each multi-course meal featured only the ripest local eats, greens, and meats. Back then, the chef would regularly buy dozens of chickens at a time from Rinconada Dairy Farm in Santa Margarita, or a whole pig, which would then be cured and enjoyed piece by piece. He—and his loyal customers—loved tucking in to plates of local meats. However, the chef admits, sourcing this way remains a cumbersome process for most chefs. When the restaurant sold, Lorenzen felt a pang of sadness for the ranchers he now called friends. What would happen to them? Who would go out of their way to use these whole, local meats when it’s so much easier to buy a hundred pork chops or 50 tri-tips from a massive distributor? Just imagine a guy in a truck filled with freshly slaughtered chickens giving a metaphorical middle finger to a backwards industrial food system. Lorenzen would never put it that brashly, but it’s hard not to see this act as some sort of David and Goliath story (with lots of giblets). 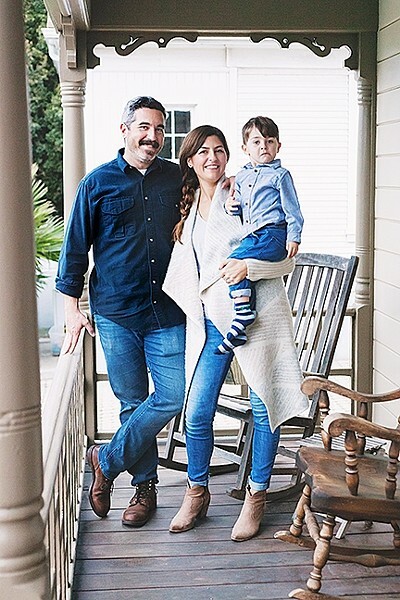 That was a year and a half ago, and since then, Grace and Jensen have figured out just where that market lives and breathes: across households around the county. ONE BEEFY BOX: As a member of the Larder Meat Co., your money goes directly to local ranchers to purchase whole animals. Owners Jensen and Grace Lorenzen like to think of it as “purchasing stock in a publicly traded company, but with much tastier options and a better ROI: feeding your family in an environmentally responsible manner and supporting our local food economy.” Learn how you can subscribe for a monthly box (choose between a small 9- to 10-pound box or larger 13- to 14-pound box) and sign up for the email newsletter at lardermeatco.com. The hen has invariably come back to roost, the story has come full circle, and you can still get those same chickens (along with the chef’s killer salt brine) from Larder Meat Co., although the box naturally changes with the seasons. Month to month, you might discover sausages, burger patties, roasts, fresh eggs, and obscure cuts that nudge you ever so subtly out of your comfort zone. A “bone box” allows bone broth lovers a way to get their fix. Beef has been dry aged for a minimum of 20 days and immediately vacuum-sealed and flash-frozen. Pork and chicken is vacuum-sealed and flash-frozen immediately after harvest, to preserve at peak freshness. Just like that home-grown head of broccoli or butter lettuce, there is something magical about slicing into meat that’s been raised and prepared with local love. Jensen said he recalls one dinner a while back when he and Grace marveled at the juiciness of a particular pork chop. Hayley Thomas Cain is slurping up the blood! She can be reached at hthomas@newtimesslo.com.